Another quality start by a Red Sox pitcher...another lackluster performance by the offense...and four more errors by the defense to further slam the point home that this just isn't a very good team at the moment. 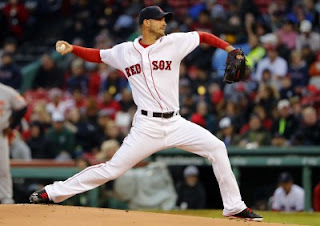 Rick Porcello received zero run support - yet again - as Boston lost 5-2 to the Orioles at Fenway Park on Monday night. The Sox righty went six innings, allowing two runs on five hits. He struck out seven and didn't walk a batter as his record fell to 1-4. Orioles "villian" Manny Machado, who took Dustin Pedroia out with a slide the last time these two teams met, made three fine defensive plays and homered off Porcello (pictured) in the Baltimore win. Both of Boston's runs came in the bottom of the eighth inning on RBI singles by Andrew Benintendi and Hanley Ramirez. A possibly bigger inning was thwarted by a base running blunder by Ramirez in the inning. The game was marred by an on-field incident in which Orioles center fielder Adam Jones said he had been taunted with racial slurs by some Boston fans and at one point a bag of peanuts was hurled in his direction. Red Sox President Sam Kennedy issued a statement which said, "The Red Sox want to publicly apologize to Adam Jones and the entire Orioles organization for what occurred at Fenway Park Monday night. No player should have an object thrown at him on the playing field, nor be subjected to any kind of racism at Fenway Park. The Red Sox have zero tolerance for such inexcusable behavior, and our entire organization and our fans are sickened by the conduct of an ignorant few. Such conduct should be reported immediately to Red Sox security, and any spectator behaving in this manner forfeits his/her right to remain in the ballpark, and may be subject to further action. Our review of last night's events is ongoing."